Former Governor Martin (Marty) Schreiber is well-known for his passion for public service. A native Milwaukeean, Marty grew up in politics. His father was first elected to public office in 1942. Marty learned the art of politics and public service at an early age while sitting at the kitchen table. 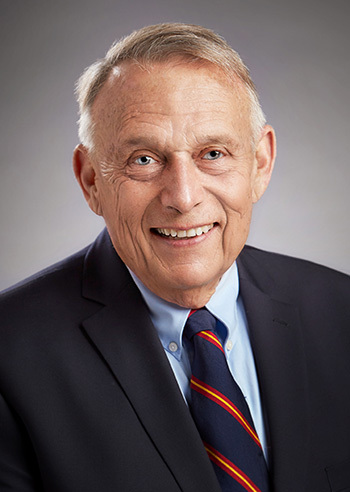 He attended Valparaiso University and the University of Wisconsin – Milwaukee and earned a doctorate of law from Marquette University. First elected to the Wisconsin State Senate in 1962, he served eight years representing portions of the city of Milwaukee. He was the youngest senator in state history, having been elected at age 23. Marty was elected Wisconsin’s 38th Lieutenant Governor in 1970. He turned this ceremonial office into a vehicle for change. His investigations into health care for the elderly identified numerous cases of Medicare fraud and abuse. He was elected the youngest chairperson for the National Lieutenant Governors Association in 1972. He was acknowledged as being the nation’s “all-star” Lieutenant Governor. He became Governor of Wisconsin in 1977. Among his accomplishments while in office were significant reforms within the state civil service system, reorganization in the Wisconsin court system and creation of the Wisconsin Fund, a program to help local communities and industries develop and pay for clean water programs. Marty received a Common Cause award for open and honest government and when he left office, Wisconsin had a projected $1 billion surplus. After serving in the public sector for 16 years, Marty became a successful insurance executive and publisher before starting his own government relations firm, Martin Schreiber & Associates Inc., (now Schreiber GR Group), in 1988. Today, he is a respected author and speaker whose focus is on raising awareness of Alzheimer’s disease and the challenges faced by caregivers. His book, My Two Elaines: Learning, Coping, and Surviving as an Alzheimer’s Caregiver, chronicles a journey that began more than 13 years ago, when his beloved wife, Elaine, was diagnosed with the disease at the age of 65. My Two Elaines is winning nationwide acclaim for its remarkable insights, its humor and its no-nonsense advice. Having found this new calling, Marty maintains an ambitious schedule of speaking appearances throughout Wisconsin and beyond, meeting with families, social workers, senior healthcare workers, physicians, students, business groups and others. Significant media attention has served to further spread Marty’s message of care-for-caregivers. Using his 50-plus years of political and business insight, Marty has become an advocate for a better understanding of Alzheimer’s in the workplace. He was singled out by Wisconsin Governor Scott Walker and former Secretary of Health Services Kitty Rhodes as planting the seed for the development of Wisconsin’s Dementia Friendly Employers Toolkit. Since its launch in 2015, the toolkit has become an important resource for human resources and employee assistance programs statewide. Copyright 2017 - Schreiber GR Group. All Rights Reserved.